Okay, I guess I should get it out there that I’m a Harry Potter fan (although the books should have been named Hermione Granger as Harry, Ron and the entire wizarding world would have been goners with out her). While I didn’t see the midnight showing, I did watch the Deathly Hallows 7B at noon on Friday in 3D. I definitely recommend the film–who wouldn’t want to see a film about a valiant fight between good and evil, set in a fantastical world populated by ghoulish monsters who want to drag the world into terrible darkness, with the only hope for salvation a group of brave young rebels? For the cupcakes: Preheat the oven to 350 degrees and line cupcake pans with paper liners. Combine your flour, baking soda, baking powder, and salt in a bowl and set aside. In a large bowl, cream your butter until light and fluffy. Add your sugars and beat until well-combined. Beat in your eggs, one at a time, mixing well after each addition. Then beat in your vanilla and butter flavoring. 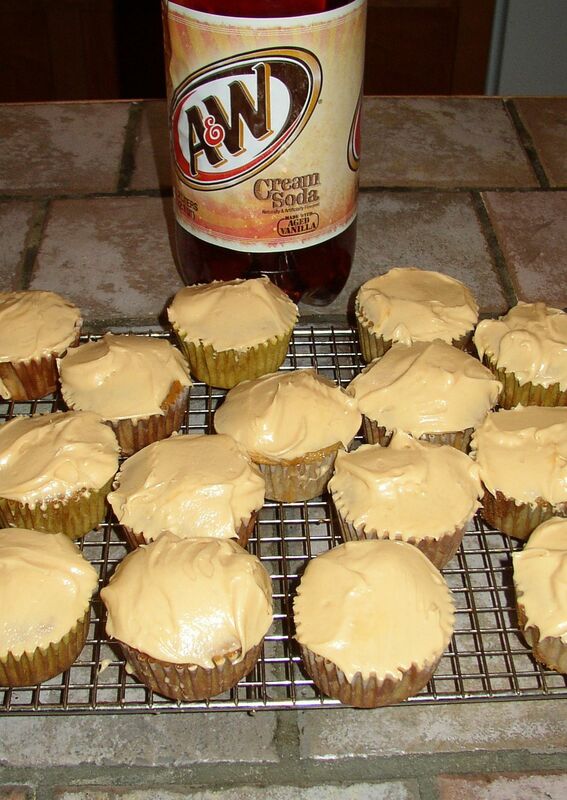 Alternate adding your buttermilk, cream soda, and dry ingredients in batches until all are well incorporated. Fill each cupcake liner 3/4 full, then bake for 15 to 17 minutes until a tester inserted into the center comes out clean and cake springs back to the touch. Cool completely on wire racks. For the butterscotch filling: In a double boiler (heat-proof bowl over a pot of simmering water on the stove), combine butterscotch chips and heavy cream and stir until completely combined and smooth. Cool to room temperature. Fill a squeeze bottle with ganache and insert into the center of each cupcake, squeezing until filling begins to overflow. For the buttercream frosting: Cream butter in a large bowl until fluffy. Add in ganache, vanilla, butter flavoring, and salt and mix until well combined. Beat in powdered sugar 1 cup at a time until reaching desired consistency. Add milk or cream by the Tablespoon as needed. Frost cupcakes and top with a drizzle of butterscotch ganache. For the real fans, divide the frosting and use food coloring to make them in your preferred House colors. Mix in a tall glass and serve over ice. Add a shot of butterscotch schnapps for an adult version. Olivier’s Restaurant serves old school Creole on the edge of the French Quarter. For Dining Out For Life (a benefit for the NO/AIDS Task Force a local HIV/AIDS service organization), I went with a couple of friends. I started with a rasberry sweet tea vodka–it was made there in house and very refreshing. The Olivier’s vinegrette was quite delicious on the mixed green salad. My entree was their Creole rabbit. The sauce was very good and the meat was very flavorful although it was a little dry. The veggies on the side were fairly bland but the pickled okra was a nice touch. One of my dining companions let me taste her pork medallions with honey glaze and a really unique habanero pepper-pineapple-plum-mint sauce. Another had Shrimp Scampi in a sauce that was more creamy than the typical wine and lemon-butter but also pretty delicious. We ended the meal with the house made peach cobbler. The crumble was incredible and it was the perfect end to the meal. Surrey’s Cafe and Juice Bar has opened another shop past Napoleon in Uptown. There is seating outside to watch the passing cars on Magazine but, frankly, it is a little warm to eat outside in New Orleans. Going in will find you eating with students, off call medics from Touro and Oschner and a few of those ladies who lunch. Surrey’s serves all sorts of great breakfast foods from omelette’s to fritattas to shrimp and grits but they also serve one of my favorite things–fried chicken and waffles. The fried boneless breast of chicken has a bit of cayenne in the seasoning to give it a little bite and they serve both maple syrup and Steen’s cane syrup with the thick but light waffles. The plate also comes with two eggs and so you leave very, very full. My dining companion got lost and arrived almost 45 minutes late, so I got to watch plenty of what other people were eating. I might have to try the BLT (bacon just hanging out of the bread) or the Ponchatula French Toast (stuffed with strawberries and cream cheese) next time. Put everything in a blender or food processor and combine. Set in refrigerator overnight. Chill Donvier ice cream insert in freezer overnight. Pulse the mixture the next morning and pour into insert. Make 2 revolutions every one to two minutes for about 20 minutes or until mixture pulls away from sides. Put into container to harden in the freezer.